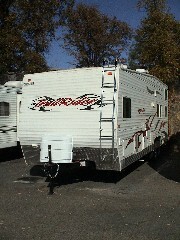 2007 Aljo TrailRider Model 260 "Toy-Hauler" - "Toy Box" - "Gear Box" is loaded with full stove oven & microwave. Free standing fold-up table & benches. Electric queen loft bed in rear, removable carpet. Air Conditioner, furnace heater, TV Antenna with two hookups. Lift up Queen size bed and bath. NEW Kitchen with Stainless Steel appliances Out side has an Optional 4KW Onan generator with 24.9 gal. fuel tank, and fueling station holding 24.9 gallons. 30 amp. hookups, extra potable water storage w/over 100 gals total. 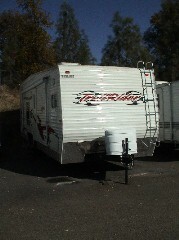 Out side equipment includes front roof ladder, spare tire, awning. Chrome Wheels and Diamond plate protection all the way around. Two 30# LPG tanks (filled). REDUCED By 1000's. Call, we'll prove it! click here for 2007 interior choices.